Dalston Lane solicitors' firm, Dowse & Co., have sustained an art artack. Graffiti art was painted onto their wall at the weekend. 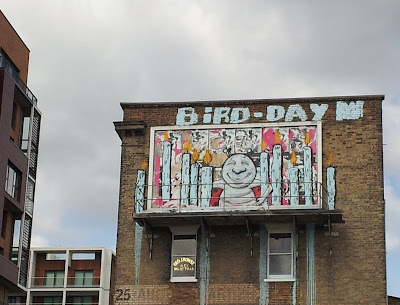 Enquiries with the Council reveal that their policy is to insist that owners of buildings remove grafitti or they send in the Environmental Enforcement Team to remove it and charge for the privilege. Solicitor Bill Parry-Davies said "It will cost us several hundred pounds if we have to remove the paint from the brickwork. So, who ever did this, thanks a lot guys! " Funny how the policy doesn't seem to apply to the Council's own buildings, like these Georgian terraced houses in Dalston Lane Conservation Area which have been ruined by municipal neglect. These houses are part of a "conservation led regeneration programme" . But now they are so far gone that, they say, only the facades can be saved. The Council has applied to itself for planning permission to demolish the remainder You can comment on that here. Guess who's back. 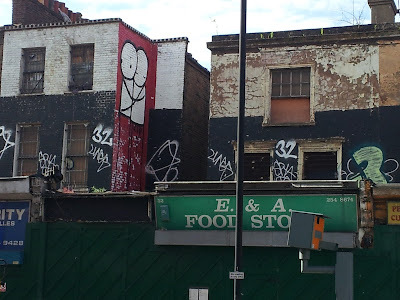 Re-developer returns to Dalston. This winter scene shows the demolished Western Curve above the tunnels - between Ashwin Street and the High Street in the foreground and, in the distance, the Boleyn Road/High Street junction. Transport for London, which led the scheme to demolish old historic Dalston and build the Dalston Square tower blocks, is back in Dalston with a new scheme. TfL propose that their partners, Taylor Wimpey, re-develop two of the key town centre sites which were demolished when the tunnels north of Dalston Junction station (towards Canonbury) were renewed. The sites are collectively know as the Western Curve. The scheme, by architects RMA, is to be presented to the public at Bootstrap's Print House Gallery, 18 Ashwin Street, on Friday 15 June between 4pm and 8pm and on Saturday 16 June between 10am and 1pm. We urge all local people to attend and comment. A planning application is expected later in the year. The Western Curve sites, which appear in dark purple on this diagram described as the Southern Site and the Northern Site, are on the north side of Dalston Lane west of Ashwin Street and on the east side of Boleyn Road. Both have extensive High Street frontages. 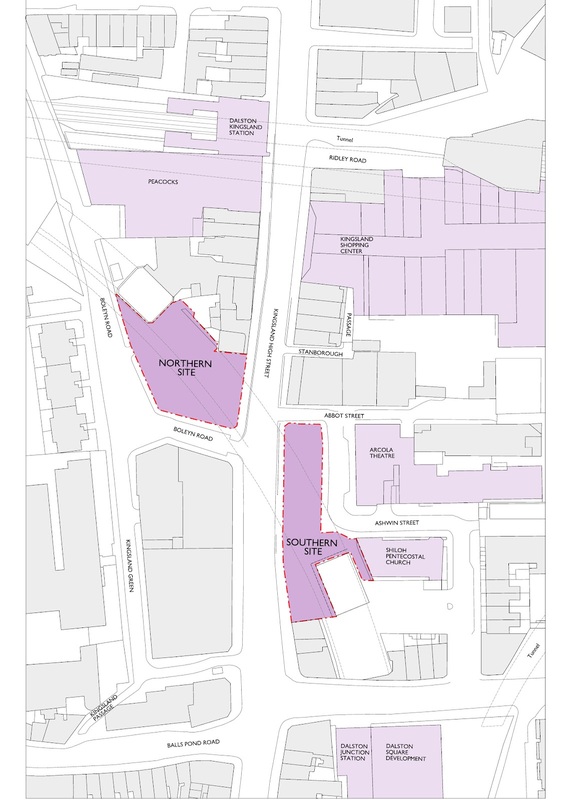 Reeves Colour Works, which is being refurbished by Arcola Theatre, and Shiloh Church on the Southern Site have an open aspect presently but will be enclosed and concealed by the proposed scheme. OPEN recently organised a meeting with Taylor Wimpey and RMA Architects to discuss their proposals. Tfl, the landowner, did not attend. It was pointed out that the scheme failed to make provision for any public open or green space anywhere, that the proposed 15 < 20% of affordable housing does not met the policy target of 50%, that building heights exceeded the Dalston Area Action Plan current policies and would diminsh local heritage assets, that the buildings would enclose Ashwin Street and block light and views of the listed Reeves Colourworks building and Shiloh Church, and would be out of scale with the Boleyn Road buildings.You can read a more detailed critique of the scheme here. The scheme will abut and dominate this historic 1902 terrace, by the Boleyn Road junction on the Northern Site, which includes Grade 2 listed Cooke's old Eels Pie and Mash shop (now Shanghai) and The Kingsland which English Heritage recently recommended should be listed by Hackney Council. What is needed is a comprehensive "joined up" plan, which also considers the additional demolition sites in the area which are owned by TfL and Hackney Council and which addresses the issues of public open and green space, rather than the piecemeal approach proposed by TfL. As mentioned above, the scheme does not comply with present Dalston Area Action Plan (DAAP) policies. The DAAP is to undergo an Examination in Public by a government appointed Inspector on 3rd July at the Town Hall. Both TfL and Taylor Wimpey have made written representations to the Inspector that they should be entitled to exceed the DAAP guidelines on building heights. OPEN has also made representations. You can read all of these here. 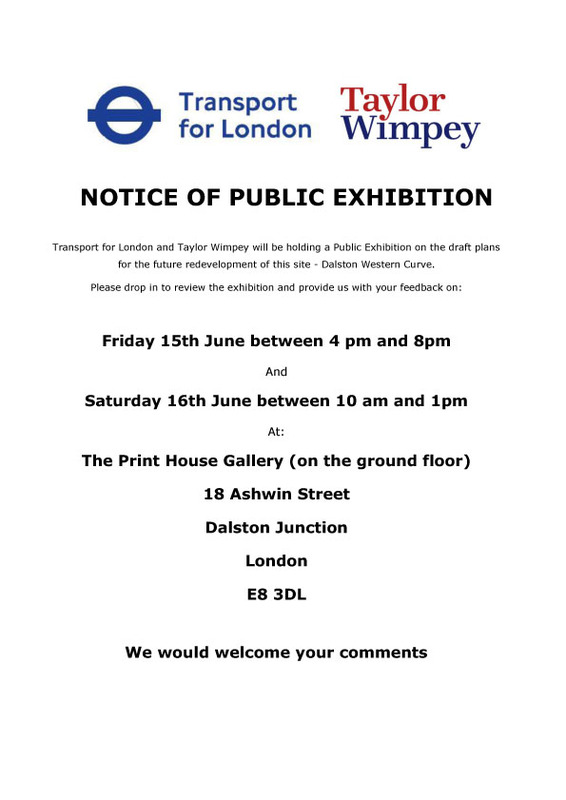 We hope that TfL/Taylor Wimpey will improve their plans before making a planning application. You can see and comment on the scheme. See the details below. App Fab! Hackney Hear triumphant (again). Multi-award winning Hackney Hear is the winner of the Race for Apps Gold Award which celebrates ground-breaking apps which successfully transform visitors' experience of the Hackney area. Produced by the Sony-award winning Hackney Podcast, the Hackney Hear iPhone app was launched in spring 2012 and is available for free download at www.hackneyhear.com. It's Director, Francesca Panetta, said "We're delighted....We hope that the app will help visitors to the Olympics and residents to explore our borough and its delights." 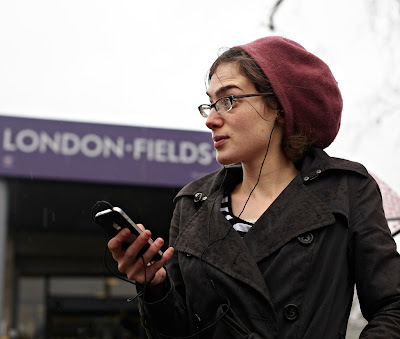 Triggering sound via GPS-location, Hackney Hear provides an innovative way to explore and rediscover London’s east end by combining sound and storytelling.The app uses “tri-sound technology” to totally immerse listeners in the area playing multiple combinations of words, music and sounds. This fab app has been described by Independent Shoreditch as "a great example of creativity, technology and ingenuity...incredible" . 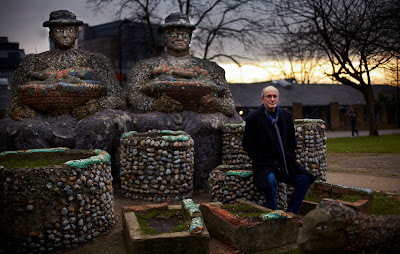 It's an exemplar and the National Trust London is now developing a sister project "Soho Voices". It's Director said "Hackney Hear is the pioneering Big Daddy of the immersive audio tour – transcendental in scope and trippy in experience." We're great fans of Hackney Podcast which uniquely chronicles contemporary Hackney's layers of cultural and social history. Here's another example of their sonic fabulousness!